Enjoy everything Niagara falls has to offer in one day trip with the expertise and live commentary of a Niagara Parks certified guide. Includes admission to Hornblower cruise, and optional Lunch at Sheraton Fallsview Penthouse Restaurant with a full view of the Horseshoe and the American falls. Explore the jewels of Niagara region - Whirlpool rapids, Niagara-on-the-lake, Floral Clock, Brock Monument, World's smallest chapel and hydropower stations. Offering Toronto downtown hotels and Pearson Airport hotels pick up and drop off. This 9.5 hour day trip will showcase all the points of interest on the Canadian side of Niagara Falls. Depart Toronto for 1.5 hours of scenic drive to the falls. With 15 years of experience, this tour is perfect for visitors from all walks of life-singles, couples, families, and small groups. Upon arrival in Niagara Falls, explore the Falls from Table Rock and then witness the falls within a few feet away from the thundering water from The Journey Behind the Falls observation deck. Make your way through the tunnels near the bottom of the Horseshoe Falls on the Canadian shore of the Niagara River. The tunnels combined is 46 meters behind the waterfall. The tunnels allow you to see the waterfall cascading in front of the open caves. 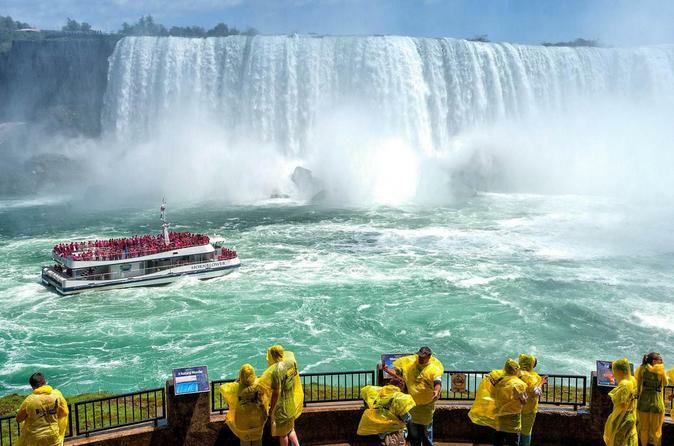 Experience all three famous waterfalls from the renowned Hornblower Niagara Falls Boat Cruise (formerly known as the Maid of the Mist). Get up close and personal with the mighty Niagara Falls, a memory that will last a lifetime. Deep inside the Great Gorge, you’ll journey along the Niagara River past the American Falls, the Bridal Veil Falls and into the very heart of the majestic Canadian Horseshoe Falls as it makes its way down the Niagara River. Enjoy a delicious buffet lunch at the Fallsview Restaurant that offers a delicious variety of meals and the best view of the Canadian Horseshoe Falls & American Falls. You'll have leisure time to explore your own at Niagara Falls, Clifton Hill by the Falls, souvenir shops and restaurants within walking distance from the Falls. Drive along the Niagara Parkway towards to Niagara-on-the-Lake - British Prime Minister, Sir Winston Churchill, described this route as "the prettiest Sunday afternoon drive in the world”. Stop at the Whirlpool Rapids - North America’s largest series of standing waves. Witness the Rapids from the edge of the cliff. If a bird’s eye view is what you’re after, consider adding the helicopter ride for an additional cost (tickets sold at discount). You'll drive through the Hydropower stations and stop for pictures at the Floral Clock- which is a 40-foot wide functioning clock - one of the largest of its kind in the world with 15,000 to 20,000 carpet plants and colorful annuals and perennials. Drive through Brock's Monument in Queenston Heights while you learn about the rich history of The Battle of Queenston Heights. This monument is in memory of the fallen Canadian hero Sir. Isaac Brock. Visit one of the beautiful local wineries and taste some of Niagara's famous wines including The Ice Wine. Stop for pictures at the world's smallest chapel. Spend free time at the quaint little town of Niagara-on-the-lake that has boutiques, artisanal eateries, and breweries. Your tour ends here and arrives back in Toronto by 6:30pm. The return time is subjected to change in traffic and weather conditions.